What is Teosyal Deep Lines? It is a transparent, non-pyrogenic, viscoelastic gel of reticulated hyaluronic acid. It may be used for the treatment of deep facial wrinkles, deep creases, and lines; restoring facial hydration; cheek augmentation; and facial shaping. 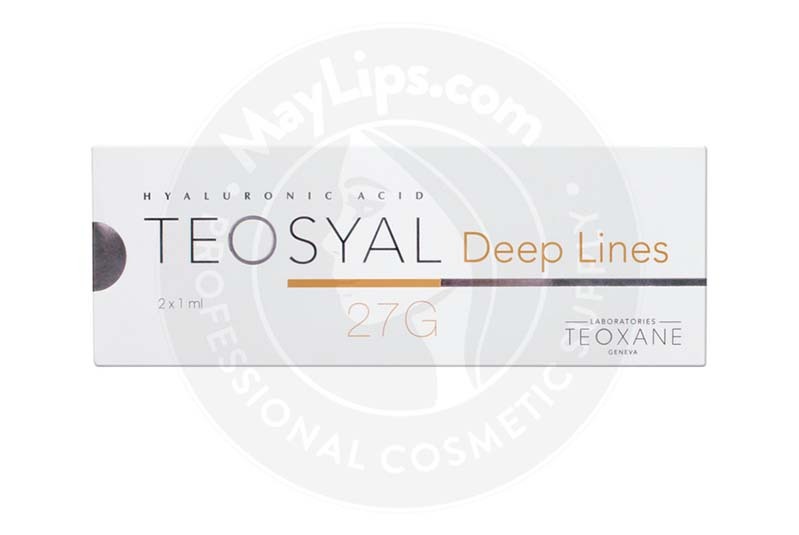 Manufactured by Teoxane Laboratories, Teosyal Deep Lines is a long-lasting, safe and effective dermal filler. Made with Teoxane’s patented technology, it contains less protein and a lower bacterial endotoxin count than other fillers, making it suitable for even the most sensitive skin types. Each package of Teosyal Deep Lines contains 2 prefilled 1mL syringes, 2 sterile 27G½” needles, a package insert, and 2 traceability labels. The box contains fragile components, and should be stored between 2°C and 25°C and away from direct sunlight. This will ensure that premature degradation does not occur. Before use, ensure that there are no visible signs of damage to the packaging. 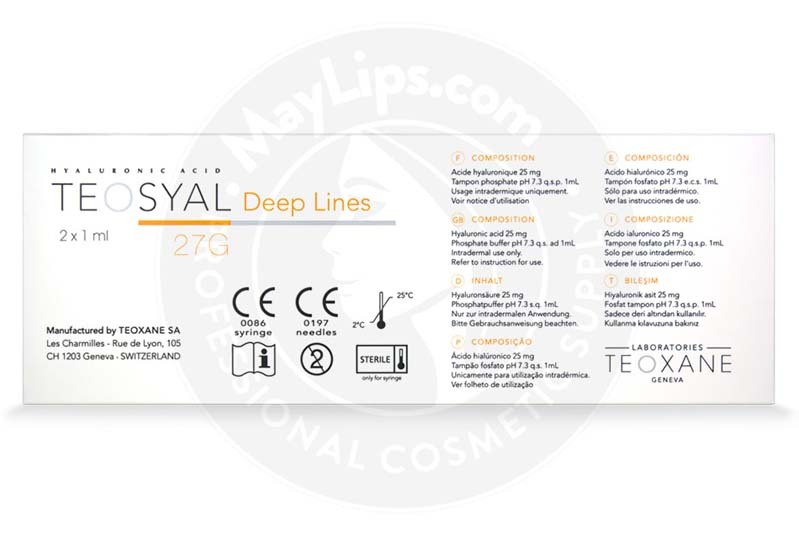 Teosyal Deep Lines has a highly dense formula, making it ideal for correcting facial folds, defining facial features, and filling in facial hollows. It also helps restore the skin’s youthful texture, moisture, and volume with the hydrating power of hyaluronic acid. Facial wrinkles and lines form as a result of the ageing process, a phenomenon caused by the body’s loss of natural hyaluronic acid. With this, the skin begins to lose its volume, dry out, and sag. Teosyal Deep Lines works to restore hyaluronic acid to the skin, reversing the visible signs of ageing. This filler’s hyaluronic acid content has an innate ability to retain water, storing about 1,000 times its weight in water molecules. This absorption results in fuller, healthier-looking skin. Teosyal Deep Lines comes supplied with an ultra-thin wall needle with a low extrusion force, allowing the gel to enter the deep dermis with minimal patient discomfort. To avoid any unwanted complications and ensure patient safety, a licensed medical professional with an understanding of both aesthetic medicine and facial anatomy must perform any injections with Teosyal Deep Lines. For optimal performance, follow the instructions supplied in the package insert to assemble the needle. If you feel obstruction or pressure during the injection, stop the procedure and change the needle. The linear threading injection technique is recommended for use with Teosyal Deep Lines. Because this facial filler is indicated for the treatment of deep lines and wrinkles, it must be injected into the deep dermal layer. Please note that if the injection is made too deeply, or into the subcutaneous tissue, the correction will not be visible. If the colour of the needle is visible beneath the skin, the injection will be too superficial, resulting in irregular corrections. The injection volume is dependent upon the level of correction required. However, it is recommended not to exceed 3ml of gel per session. It is important not to overcorrect, as this will create undesirable results. This treatment takes between 20 and 30 minutes to complete, depending in how many areas are being treated. It is widely considered to be painless procedure, but if wrinkles around the mouth area are being treated, a local anaesthetic cream can be applied 30 minutes before the procedure. First results are usually visible right after the procedure. After injection, massage the treated sites carefully in order to ensure uniform distribution of the gel. Advise the patient not to use makeup for 12 hours following the injection, and to avoid extreme temperatures for 1 week post-treatment. It is essential to discard all remaining unused product and to dispose of needles safely. While results will vary from patient to patient due to level of the required correction, the patient’s age and lifestyle, and the placement of this filler, Teosyal has been shown to last between 6 and 9 months in the skin. Generally, the patient’s desired results will occur after only a single treatment. However, in some cases, 2 treatments will be necessary. In order to maintain the obtained results, a smaller top up treatment will be necessary as the product begins to degrade. 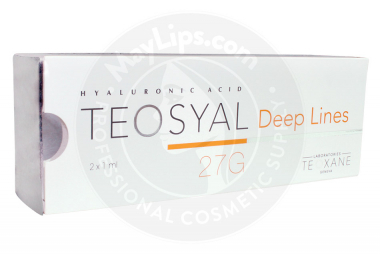 Teosyal Deep Lines is incredibly safe for patient use, as it is made with non-animal hyaluronic acid. Made from the Streptococcus species of bacteria, this filler’s hyaluronic acid has a higher rate of tolerability than that gleaned from animal sources. This being said, certain individuals should not use Teosyal Deep Lines. This product is not recommended for pregnant women, women who are breastfeeding, children, or individuals who are hypersensitive to hyaluronic acid. Additionally, it should not be used in combination with chemical peels or laser treatments, as this may result in inflammation. Those who are receiving treatment for an autoimmune disease should not use this filler. While most individuals do not experience reactions to Teosyal Deep Lines, some side effects may occur at or around the injection site. However, these often resolve themselves within 7 days of treatment, and are usually very minor. If any serious side effects are experienced, the patient should seek immediate medical attention. 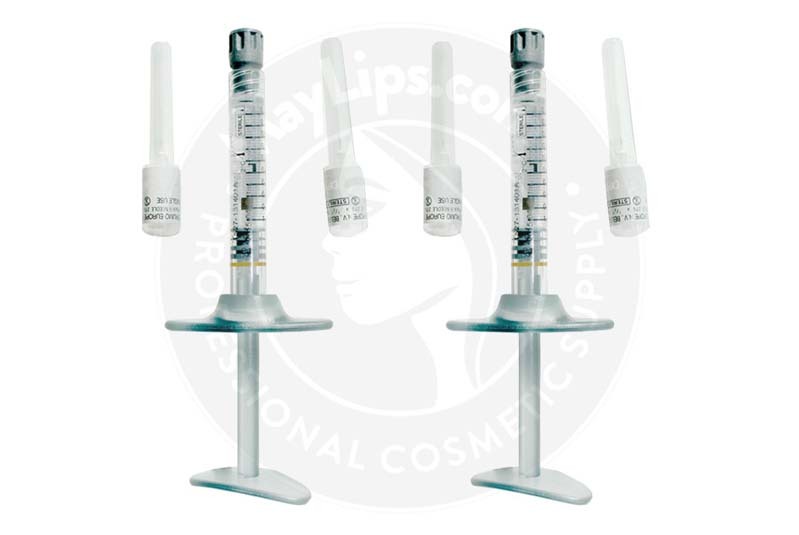 Teosyal Deep Lines is an injectable cosmetic filler made with non-animal, stabilised hyaluronic acid. Hyaluronic acid is found naturally in the skin, helping to cushion, hydrate, and volumise on a cellular level. Unfortunately, as the ageing process occurs, the body’s natural levels of hyaluronic acid diminish, leading to the appearance of dehydrated, wrinkles, sagging skin. Luckily, this can be reversed with hyaluronic acid injections, like Teosyal Deep Lines. This restores the skin’s moisture levels, creating a more even complexion and texture. Ingredients: Reticulated hyaluronic acid (25 mg/ml). Size 2x1 mL pre-filled syringe. Also Included: For each syringe, the box contains two sterile 27G1/2” needles. Package insert. Two tractability labels (one to be given to the patient, and one to be kept by the doctor in the patient's file).